We also added a new status variable to track when truncation happens as well – innodb_truncated_status_writes, so you can detect this should you have automated monitoring depending on this output. 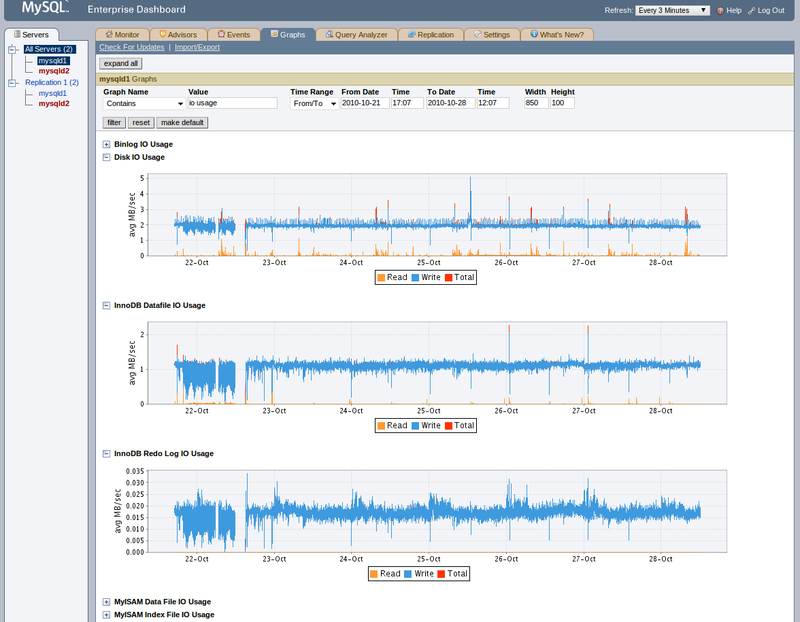 Leading up to my previous post, I had been doing some work to start the integration of PERFORMANCE_SCHEMA data with MySQL Enterprise Monitor, including some new graphs based on some of the data that I talked about in the above post..
Mark Callaghan over at Facebook wrote a note recently about InnoDB disk IO counters in SHOW STATUS, with some extra things that he wanted to track. I posted a quick comment over there, but I thought this deserved it’s own write up. MySQL 5.5’s PERFORMANCE_SCHEMA has had a fair bit written about it in terms of tracking synchronization point contention (mutexes etc. ), but it currently tracks two orders within the wait class – these are /wait/synch and /wait/io. Actually, allow me to detour first, it’s not clear from the documentation, though it is clear in the worklog. Each event within PERFORMANCE_SCHEMA is a specific instrumentation point, tracked in some way, such as recording the time taken to complete the event (a specific code section). The naming convention for each event follows Linnaean taxonomy – /Class/Order/Family/Genus/Species. We currently have one major class – /wait. The /wait/synch order is already fleshed out fully, including /wait/synch/cond (condition signalling), /wait/synch/mutex (mutex locks) and /wait/synch/rwlock (read/write locks) families. Detour done.. The /wait/io order has one family within it currently – /wait/io/file, which instruments all file IO for the SQL layer (the /wait/io/file/sql genus), tracking binary logs, frm file access, info files, etc., as well as for all table/index file IO done by instrumented storage engines (such as the /wait/io/file/innodb / /wait/io/file/myisam genera). You can track how much time has been spent on these events with the EVENTS_WAITS_SUMMARY_* tables, which I won’t talk about here, see my earlier post for examples. But wait, it doesn’t end there. Mark also wants to be able to break out writes to things like the doublewrite buffer. This is hard to do when tracking data file IO alone as single counters as above, because all writes to the doublewrite buffer also go to the central tablespace’s data file. Of course, you can SELECT the value for Innodb_dblwr_writes as Mark does and subtract that from the above counters if you want to, but I have a slightly different example using the FILE_SUMMARY_BY_INSTANCE table. The database instance the above comes from is only using innodb_file_per_table tables, so why all the writes to the central tablespace? Two major reasons.. The doublewrite buffer, and the undo log..
Also note that we can get down to the partition level here as well, so we can find hot partitions too. Subtracting the doublewrite overhead from the central tablespace datafile IO should give you the added benefit of also drilling in to undo log IO writes as well (perhaps with some extra fuzz factor for other writes to the central tablespace that happen).